"We were abducted, my mother, father, sister and me. Then they killed my parents and separated me from my sister. I was five," Abouk tells us in a low voice. "I stayed with one of the men who kidnapped us and took care of his goats." Slaves is about Abouk, nine, and Machiek, fifteen. Like thousands of children they were taken by the government-sponsored militia in Sudan and used as slaves. They were later liberated by an organization headed by James Auger. Slaves—An Animated Documentary is based on an interview conducted in 2003 and is the second film in a series of animated documentaries with and about children in difficult situations by David Aronowitsch and Hanna Heilborn. David Aronowitsch was born in Stockholm in 1964. He studied directing at the Polish National Film School in Lodz from 1988-1991. He produced his first short documentary in 1988 and his first longer documentary in 1994, Night of the Gypsies, together with Göran Olsson. 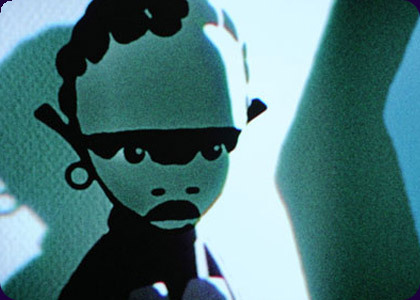 Other later films include Stockholm-75, the story of a former RAF terrorist, and the globally-screened short film Hidden—An Animated Documentary, made together with Hanna Heilborn and Mats Johansson. Aronowitsch was also the producer of the television series Ikon for SVT in 2001 and 2002. Hanna Heilborn was born in 1968 and was educated at the New York Film School and Sweden's Institute of Drama. She works as a director, scriptwriter, dramaturgist and animation instructor, all with a documentary focus. She lectures at a number of art and design schools. Her leaning towards art and design can be felt in the prize-winning animated documentary Hidden, made together with David Aronowitsch and Mats Johansson. Recent films include Big Mike about an aboriginal man going back to his roots, Tjejsnack/Girls' Talk, an MTV trilogy of short documentaries about the life of teenage girls on drugs, and around twenty installations and informational films for The Technical Museum of Sweden.